Achieve your career goal with industry recognized learning paths. We are the best big data hadoop training institutes in Bangalore. We offer you the opportunity to master your skills in big data hadoop such as MapReduce, Hive, Pig, HBase, Flume, Apache Spark and many others. After completion of the certification, you will be able to show your skills in some sectors such as IT, data management, finance and many others. Whether you are an expert in data processing or you are a beginner to have a career in data, you can go for this course in Big Data Hadoop Training In Bangalore. Science and Data Engineering starts here. IT professionals, or anyone who is looking towards building a career in Big Data and Hadoop are ideal participants for the Big Data and Hadoop training. The Big Data and Hadoop internship is an opportunity to access the knowledge on YARN,the data operating system where you are going to learn Script, SQL, JAVA,.. In PRWATECH we make sure that real time experience is being given to students and professional , through workshop in advance fields like BIG Data & Hadoop.. Learn to lead the future communication technology. Data management occupies first place among all other existing technologies. Equip to face the challenges of by developing the capabilities and skill sets to match the present industry requirements. A comprehensive Big Data Internship leads to explore the amazing world of data management from the core. Knowing the power of Hadoop Certification Courses in India makes you handle efficiently all the operations from beginning to end, enabling to handle all the levels of projects smoothly. The Big Data Hadoop Training in Bangalore internship is an opportunity to access the knowledge on YARN, the data operating system where you are going to learn Script, SQL, JAVA, NoSQL, Stream, in memory, and become an expert in HDFS (Hadoop distributed file system). The Big Data Hadoop training in Bangalore, introduces multiple processes and languages that works successfully with Hadoop cluster. 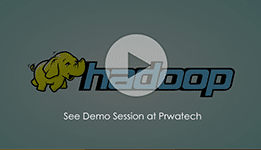 Big data training institutes in Bangalore such as PRWATECH assists aspirants and professionals to know more about the different platforms used for Hadoop operations. YARN divides the purpose of handling the data into four major categories. The Best Hadoop training in Bangalore is provided by the PRWATECH, one of the pioneers in the field of Big Data Courses In Bangalore. Training professionals helping them to hone their skills and develop requisite expertise in the field of Hadoop and big data management. Big Data and Hadoop Training in Bangalore and Big Data Hadoop Courses in Bangalore covers all the programs such as Apache, Apache Cassandra and other relevant subjects, making aspirants capable enough to explore the world of Hadoop from the core to finish. Explore and expedite your career life with the help of PRWATECH.